The camp offers 28 hours of sailing instruction on shore and on the water. 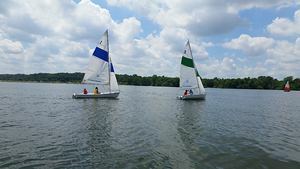 Students will sail on a variety of small sailboats ranging from 7 to 11 feet long. After successful completion of the course, students are welcome to rejoin for the next summer's advancement in sailing lessons, to continue to grow and learn in session this summer, or attend the Club's social events. Students will not only learn the sport of sailing, but they will also learn a variety life skills. For example, sailing is a team sport, students will gain practice collaborating and working with peers. While on the water, students will exercise what they learned in school this year as they use their brains to tie knots, trim sails, maneuver a boat, and read the wind. Not only are they exercising their mind, but sailing is also a great physical activity! Taking part in this course is a great alternative to traditional summer camps, as sailing offers so many possibilities! The best part about learning to sail young, it that it is a sport for all ages! Participating in the camp opens new doors for lifelong learning and adventure! For each day students are asked to supply their own properly fitting life jacket, water shoes, a water bottle, sunscreen and a packed lunch. 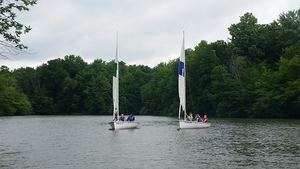 The curriculum for each shore school class and on the water instruction is inspired by the American Sailing Association's Basic small boat sailing standards.